I recently attended a Newsjacking webinar with the legendary David Meerman Scott. He is the author of the blockbuster book, The New Rules of Marketing & PR, which has sold over 300,000 copies and been translated into more than 25 languages. With that book, Scott extolled the virtues of direct-to-consumer news releases. It was basically the origin of the content marketing movement. Scott has written seven other books, including Newsjacking, the subject of his webinar. Scott is also proprietor of WebInkNow, one of the most influential marketing blogs ever, and has his own imprint for publisher John Wiley & Sons — the “New Rules” series — with books from many different authors. Scott is a powerhouse speaker and consultant, traveling the world (he lived in Tokyo for seven years) teaching modern marketing principles, and writing about what he sees along the way. Surprisingly, Scott is still independent, as he pointed out in his webinar: it’s just him, not some big PR firm. If he can do this, you can too! Maybe. Scott is a masterful journalist who gleans something from everyone he talks to, then assembles the results with style and panache. Few are as gifted with language as David Meerman Scott. That’s why companies often need the talents of journalists to properly communicate their brands. Newsjacking is breaking in on breaking news to deliver a brand message. The latest major example is the birth of George Alexander Louis Mountbatten-Windsor — heir to the throne of England. Scott pointed out that marketers had six months’ notice that this story was going to break. Thousands of marketers tried to squeeze in on the action with social media designed and timed to coincide. Scott illustrated some winners and losers in the race to cash in on royal baby mania. He’s more impressed with marketers who are able to ride breaking news. He gave the example of Oreo having a clever graphic and tweet online four minutes into the Super Bowl blackout of 2013. Empower the marketing team in advance to act in the moment. 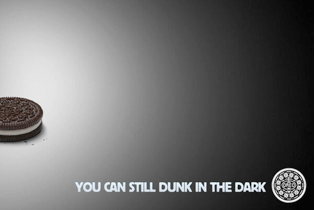 Oreo had this image on Twitter four minutes into the Super Bowl blackout of 2013. Can your team move that quickly? What Scott admires is the ability of Oreo to field a team of social media marketers — including at minimum a writer, a graphic artist, and a social media expert — and have them working on a weekend when most people (including their bosses) are somewhere watching the game and having a good time. The Oreo team was authorized to respond to breaking news without running the messaging through normal channels of approval. The secret to this newsjack was empowering people in advance to act in the moment. It can bring great rewards, but it can also be dangerous. Scott cites idiotic attempts by marketers to ride news of the Boston bombing as reason to stay away from difficult news. He also suggests that marketers stay out of fields that have nothing to do with their brands. But that begs the question of what Oreo was doing live-tweeting the Super Bowl? 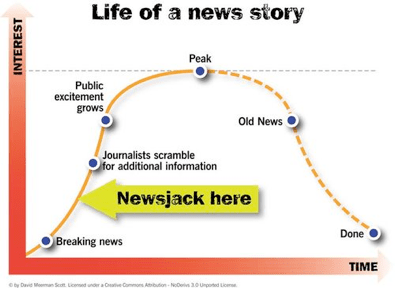 Newsjacking is an attempt by marketers to bust in on the biggest story making the news. Newsblogging, on the other hand, is focusing on providing commentary on breaking news in the field. The former looks for ways to break into stories, the latter is more about regularly breaking stories. The soul of Newsblogging is the concept that the job of an organization’s blog is not to report on the capabilities of the organization, but to comment on breaking news stories that are important to their target audiences. Newsblogging is simple: Do the news. That’s what NBC and ABC and CBS do. It’s also what Fox News and MSNBC and CNN do. And it’s what Bloomberg and Dow Jones and the Motley Fools do. It’s also what Comedy Central and PBS and ESPN and MTV and The Weather Channel do. They all comment on breaking news of greatest interest to the target audience. What these companies are doing is commenting on the news. The news is not about themselves. They are not, by themselves, creating the news; they are deciding which events to present and how to present them. The New York Times does the same; it chooses the news. So can you! In the case of SixEstate, we assemble an entire news department for a blog: a writer, an editor, an optimizer, a graphic artist, and a tracking expert — plus tech support. Like the major media, our bloggers choose among breaking stories based on what they think the target audience is most interested in. Like the major media, our bloggers sometimes conduct interviews with experts and people close to a story. In the past six weeks, one of our science bloggers scooped The Wall Street Journal once and The Economist twice. He “broke” stories he had gleaned from scientific papers and journals. Days after his posts were submitted, the same stories appeared in the major media, citing the same sources. Think about how much of the news is based on finding something, then sharing it with your audience? If you pay someone to pay attention to news in your industry, they will often put your blog ahead of the news cycle. I’ve seen it happen time and again with SixEstate Newsblogs. People say that without the mainstream media we would have no original reporting, just a thousand blogs repeating the same AP story. But the opposite is true. We have the same set of facts, and a thousand different journalists putting them into perspective. It’s not the decline of journalism — it’s the multiplication of journalism. Every company of any size has the capability to produce a credible newscast. If your organization doesn’t have a news department, you’re allowing other people to define your brand and your industry. One of the ways Newsblogging is different from Newsjacking is that we pick our stories based on the target audience, not how many people are interested in the topic. We learned early on we could boost our numbers by Newsblogging about celebrities. Our blog on obesity gets crushing traffic if we mention Oprah Winfrey or Carnie Wilson. Traffic on our political blogs rose faster than fireworks on the Fourth of July if we so much as mentioned Ron Paul. Today, we try to avoid getting big numbers for anything that’s not in our field. Incredible but true. We don’t want the traffic. It costs money to cultivate traffic and we only have enough to focus on people who are likely to become customers or investors or donors or volunteers at some point. Another credibility issue that Scott mentioned in his webinar is the difficulty of pulling off Newsjacking in an area that has nothing to do with your brand. Then again, he trotted out the now-stale example of the Chilean miners wearing Oakley sunglasses, a clever but ultimately crass product placement that was the star case history in his book, Newsjacking. People sometimes question the credibility of Newsblogging because we use professional journalists rather than company insiders to draft blog posts. Our newsbloggers have bylines; they write under their own names, and they don’t ghost-blog for insiders. We think that brings transparency and credibility to the process. It also puts some distance between the editorial and advertorial goals of blogging. The problem with using an insider is the ever-creeping tendency to write puff pieces about your own organization’s capabilities. Blogs that are company-written, or anonymously written, tend to deteriorate into drivel fairly rapidly. A Newsblog, on the other hand, with a real journalist signing each piece and a newsroom behind her doing fact-checking, link-checking, optimization, artwork, and multimedia, is a force to be reckoned with. You can assemble your own newsroom or news team without spending a lot. And you can hire a team from SixEstate or other providers for even less. Why buy the whole news department when you can lease the team for a couple hours a day? Call it News-as-a-Service. This is precisely the operation David Meerman Scott holds up as the marketing department of the future: something that looks like a commodities trading bullpen, filled with monitors and an instant-response marketing team continuously watching the news for stories, listening to the buzz on social networks, combing the media for coverage, and responding in real time to comments, compliments, complaints, opportunities, and disasters. David immediately got defensive, then angry, about having to discuss the metrics of audience measurement, tracking and, especially, return on investment (ROI). “I hate the ROI question,” he said, exasperated. He had just finished showing slides indicating that over a nine-month period, those Fortune 100 companies with an active social media presence registered a 3% gain in share price vs. a 2% decline for those with no social media presence. Of course, no one can say share values increased or decreased because of social media, but that’s an impressive stat. Another impressive stat is that two-thirds of the Fortune 100 companies that tweet had increased share values over that time span, whereas two-thirds of those who didn’t tweet had declining values. Put those numbers in your next presentation — and credit David Meerman Scott. But share value is not ROI. In the last chapter of my last book, Complete Guide to Internet Publicity, I spit out a long rant against measuring success with ROI. Thankfully, Scott did not have time to review all the arguments against trying to attach purchases to specific brand impressions. What it comes down to is this: If you wait to commit to social marketing until someone can prove the ROI to you, you will be too late. In Newsjacking, too late doesn’t cut it. Scott repeatedly showed a slide indicating that Newsjacking is most effective when done between the moment an event happens and when the press piles on. You need to have an empowered team watching and waiting for those moments to arise. Anyone waiting for the numbers to come in on ROI before acting might as well give up now. You have to have some panache to play this game. Google loves original reporting on breaking news topics. Google loves a real journalist with a real name selecting stories and presenting them to the public at no charge. The ironic thing is that Scott’s webinar was sponsored by Salesforce.com, the customer relationship management (CRM) service that has taken small business by storm (well, by cloud). Saleforce.com basically automates the process of using content to attract prospects, then turn those prospects into subscribers and contacts and customers, then track all the organization’s interactions with each contact for the rest of their lives! It’s not ROI, but it’s a good substitute. Congratulations to Salesforce.com for putting on this webinar and making the connection between content marketing and CRM. You are not going to make the news unless you start making the news. The sooner you get going, the faster your content pool will grow. At some point, it becomes an unfair competitive advantage, the way Amazon’s reader reviews are a proprietary advantage and the envy of online retailers. What’s the ROI on that? Priceless!